Sunshine Quilt for a New Arrival | Keeps Me Out Of Mischief! I’ve definitely got to the stage where all my friends are popping out sprogs. My sister, who is five years younger than me, is at the stage where she spends each summer on a tour of the country going to her friend’s weddings. I’m older so we’ve all moved on a stage! This quilt was created for a work friend of mine who has just gone off on maternity leave. Another work colleague organised a baby shower for her and we all brought a gift. We’d had a conversation a few months ago about what I could make for the impending arrival and I’d suggested a quilt for the cot. I’d noticed on Facebook that the colours they ‘d painted the nursery were yellows and oranges so I used them as the inspiration for this sunshiny quilt. It’s a fairly easy quilt to put together. I cut out 15 squares measuring 12cmx12cm of each of the yellow and orange fabrics and pieced it together much as I had done for my reversible quilt. 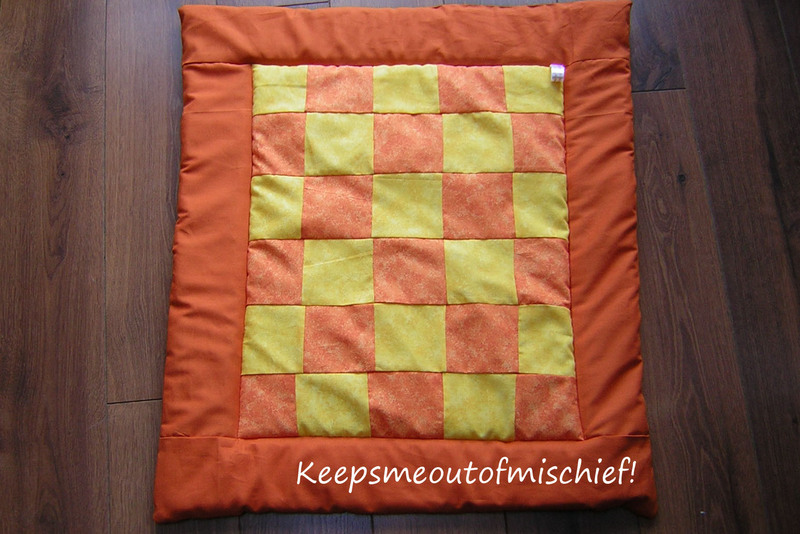 Once it was sewn together I added a plain orange border and backed it with the same colour. I filled it with a slightly lighter weight wadding than last time as I thought the last one seemed a bit too heavy for a little baby. Now I’m getting a bit more confident with quilting I’m going to have to have a go at a design that’s a bit more complicated. I’ve seen some lovely ideas on Pinterest…. just need to find the time to get on with it! Baby Eliza has arrived this afternoon so it’ll be put to good use soon!